.....is so much easier today. This makes life so much simpler so thank you President Obama. Don't you agree? Joe Biden has been a poster boy for term limits ...Vote For Some New Faces! DON'T VOTE FOR THESE SPENDTHRIFTS! WE NEED SOME NEW BLOOD IN WASHINGTON! ELECT PEOPLE WHO WON'T SPEND US INTO THE POORHOUSE! This man sat in the U.S. Senate for 36 years while the federal government spent the country into near bankruptcy. Joe Biden joined the senate in 1973 when the social security tax rate was 9.7% and the maximum tax was $1,048 per year. When Biden left the Senate 36 years laters, the tax rate was 12.4% and the maximum tax was $13,243! During Biden's stay in the Senate, this government program's income grew exponentially yet the program is nearly broke. What does this tell you about people like Joe Biden? That no matter how much they increase taxes, it is never enough to cover their exorbitant spending! Politicians like Joe Biden are incapable of fixing the county's fiscal problems. They caused the problems. And then they kicked the can down the road. Don't trust Joe Biden to fix our country's finances. Don't let him enact new taxes to cover up his sins! And don't trust his boss, Barack Obama, to fix these spending problems either! Vote for the new guys! The American people need some new blood in Washington! 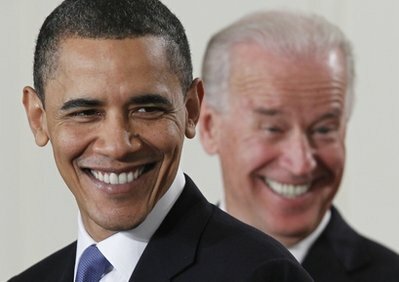 Note: Biden was not alone in screwing up the government checkbook. There are many, many other longtime members of Congress who are as guilty as Biden. They include John McCain, Arlen Specter and Frank Lautenberg to name just a few. ...til ejection day. When I expect many, many Congress critters will be ejected from their jobs by the voters. But what do I know. ...... was such a good comic strip. I rarely re-read books but I am re-reading Gary Larson's "The PreHistory of THE FAR SIDE". 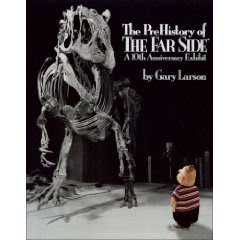 Larson explains how everything about the Far Side came to be. Hilarious. I highly recommend it. Here is a link to Amazon to buy it. .....if the health reform bill does not pass. But with all this late-night work by the generally aged Congress critters, I wouldn't be surprised if a couple of them dropped dead from a heart attack before the vote is even held. Wouldn't that throw a monkey wrench into the vote count? Of course, the Dems would just wheel in the corpse and let the dead vote! It would not be the first time. 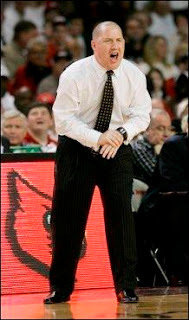 ......the basketball coach at Marquette is who they should get to play Curly Howard in the Three Stooges movie. Check out his dance moves at the link below. He is a very good coach but I think he would have made a very good Curly! "Let me get this straight. We're going to be gifted with a health care plan written by a committee whose chairman says he doesn't understand it, passed by a Congress that hasn't read it but exempts themselves from it, to be signed by a president who also hasn't read it and who smokes, with funding administered by a treasury chief who didn't pay his taxes, to be overseen by a surgeon general who is obese, and financed by a country that's broke. What could possibly go wrong? " .....championship??? Hahaha. For some odd reason, I have CNN on the TV and their chief news-reader, Wolf Blitzer, just said "stay tuned to hear who President Obama is picking in the NAACP championships". I swear I do not make this stuff up. Here is a link to Wolf's error -will he blame it on his teleprompter? Perhaps he will just berate a CNN intern? ...which of these is correct? According to a US Census report, in 2004, it was 85% while a report today from the Associated Press claimed it is just 70%. I can't explain the big variance between the Census department's 85% in 2004 vs. the Obama administration's 70% today. Perhaps the two reports are not apples to apples. However, I do believe inconsistent [perhaps unreliable] data prevents us from making smart, informed decisions and from properly allocating scarce resources.